The end of week one! We did it…..well mostly! I feel like I am back in the groove of Whole30 and am not missing my treats as much as I thought I would! As mentioned yesterday I have a hectic week. I went to the doctors today and yes my burn in bad…3rd degree burn with exposed nerves. In a lot of pain and am hosting my first fundraiser tomorrow night..so will keep this short and sweet as I have a presentation to finalise and lots of food to prepare! Experimental Findings: Michal reported that the roast dinner was “yum” and that he felt really satisfied after this meal. The key finding of the day was that in camp you have little control over your choices. It can be difficult to choose a healthy option if that option is not appealing or lacks variety from meal to meal. Michal resisted this temptation well today but I feel that if he did not enjoy his evening meal following a less than satisfying lunch, it would be difficult to resist in the same circumstances tomorrow. Conclusion: When it comes to maintaining a restricted diet, being in control is paramount. It is important to be able to make choices for yourself and choose foods that you enjoy and make your meals satisfying. This is an issue in camp and potentially make you resent the lifestyle you are undertaking, instead of enjoying it and its benefits. Just letting you all know that tomorrow night I will be hosting my Girls Night In for Breast Cancer Research. I am hoping for a really successful event and to raise a significant amount of money for the cause! I probably won’t get to post our meals tomorrow night, but will be sure to update you all on Friday morning! 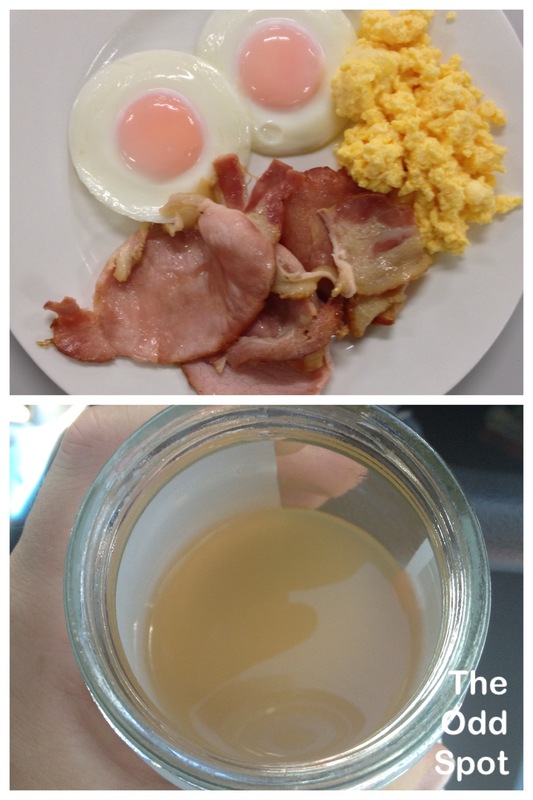 Today’s photo is of Michal’s Breakfast, but I have included a pic of the delicious Water Kefir that the lovely Sara made and shared with me! I love learning from others, discussing ideas and of course trying each others creations! Temptation of the day: We didn’t get to discuss temptation today as I was trying to get 2 children to bed with the skin coming off my foot!! Our conversation consisted of a text that asked Michal what he ate today, his reply, and good night. Therefore for this section the results are determined to be invalid due to recording error. Experimental Findings: If you drop boiling liquid on your foot, you ability to engage in the findings of the experiment and extract required data will be negatively affected. Also forgot to ask for pictures today.